Filmmaker Julian Schnabel is first and foremost a painter. While he has six directing credits to his name since 1996's Basquiat, Schnabel is perhaps best known for his work in the art world rather than in film. Yet there is something almost painterly about his films. It was obvious in 2007's The Diving Bell and the Butterfly, with his stunning use of close-ups to suggest the inner life of Jean-Dominique Bauby, a paralyzed man who could only communicate by blinking. 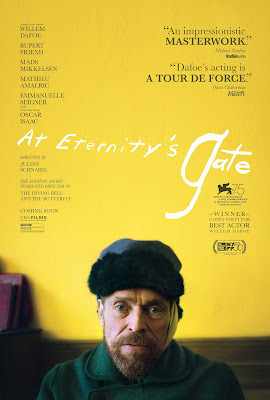 His latest work, At Eternity’s Gate, is something else entirely - a breathtaking tribute to one artist by another. Here, Schnabel examines the final days of the legendary Vincent Van Gogh (Willem Dafoe). As he did in Basquiat, Schnabel has turned his passion for a great artist and turned it into something deeply personal, often abstract, and genuinely profound. This is not a typical biopic; Schnabel isn't interested in the historical details of Van Gogh's life, nor is he interested in creating a linear through-line in which to play connect-the-dots with facts. Just as Van Gogh was an impressionist painter, so too is At Eternity’s Gate an impressionist film, capturing the inner workings of the artist's singular vision, seeking to evoke his emotion and passion in striking visual ways. Unlike last year's beautiful but thuddingly literal Loving Vincent, At Eternity’s Gate recalls Van Gogh's visual style without copying it directly. Schnabel offers a window into Van Gogh's mind, often filming in first person POV to put is directly in his shoes. When we look at the world through Vincent's eyes, colors become brighter, objects become distorted, and suddenly we see the vibrant beauty in even the most mundane objects of nature's abundance. It's an exhilarating experience, and Schnabel spends long, wordless sequences lingering on landscapes as Van Gogh trudges through the countryside in a kind of ecstatic reverie, seeing the world around him as it can only be seen by a great artist. 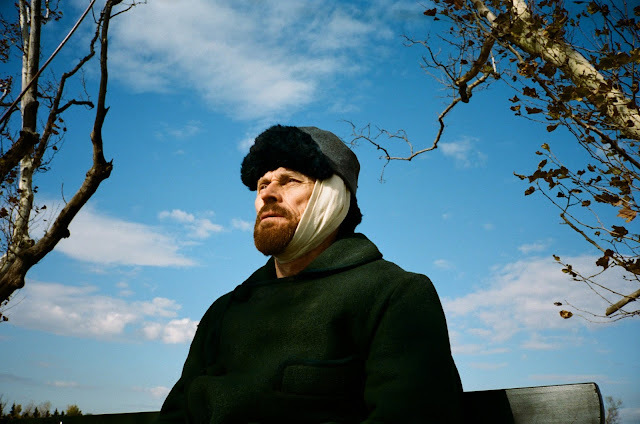 Rather than illuminate Van Gogh as a historical figure, At Eternity’s Gate chooses instead to illuminate him as an artist. Its unlikely audiences will leave the film knowing more about him than when they went in, but that's not really the point here. Schnabel is more interested in how Van Gogh saw the world, in examining what made him tick, what motivated him to create some of the most beautiful paintings ever created. Through Dafoe's deeply acutely introspective performance, Schnabel is able to imagine the world is seen by one the great masters of the medium, a man who found success only in death, yet saw the world in a way no one else did. Much like the artist himself observed the world, the film sees him not necessarily as he really was, instead examining the essence of the man through work he created. It's a thrilling thing to watch one artist grapple with the work of another in such a passionate and evocative way. It's something like a daydream, a wistful and yearning work that pines for the beauty in all things, combining vibrant cinematography by Benoît Delhomme and pensive music by Tatiana Lisovkaia to create a fully immersive experience. It suggests Van Gogh without directly copying him, leaving us with winsome and haunted impressions of a man we're really only able to know by the artwork he left behind. At Eternity’s Gate recognizes that legacy as a kind of gift to the world that reverberates into the infinite, mysterious and unknowable, and seeks not to understand, but to feel a legend as only another artist truly could. AT ETERNITY'S GATE | Directed by Julian Schnabel | Stars Willem Dafoe, Rupert Friend, Oscar Isaac, Mads Mikkelsen, Mathieu Amalric, Emmanuelle Seigner, Niels Arestrup | Rated PG-13 for some thematic content | Now playing in select cities.